1997 (April) Sports Illustrated for Kids #568 Emmitt Smith Insert. 1997 (November) Sports Illustrated for Kids #632 Jerry Rice Insert. SPORTS ILLUSTRATED FOR KIDS~AUG 1997~TIGER WOODS ROARS! Original, real nice condition with no tears or markings. No torn, missing or marked pages. Perfect condition. 1997 (October) Sports Illustrated for Kids #625 Troy Aikman Insert. 1997 (August) Sports Illustrated for Kids #604 Drew Bledsoe Insert. Magazine is in NEAR MINT condition. 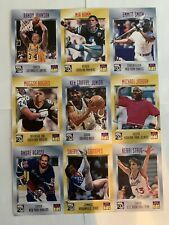 APRIL 1997 Sports Illustrated for Kids APRIL FOOLS WITH UNCUT PLAYER CARDS - WRONG SPORTS. KEN GRIFFEY, JR, AS A BASKETBALL PLAYER. ANDRE AGASSI AS A HOCKEY PLAYER. AUGUST 1997 Sports Illustrated for Kids Magazine w/ TIGER WOODS on the cover! This is a newsstand magazine! No Mailing label and MINT condition ..It is complete w/ a tight spine ,great color,displays well This MAGAZINE STILL HAS THE CARDS INTACT INSIDE-SEE PIC!! Please add $4.00 Shipping/Handling. Sports Illustrated For Kids EXTRA Spectacular Sports Yearbook. Sports Illustrated For Kids Rebecca Lobo Lisa Leslie June 1997. Shipped with USPS First Class Package. Condition is VG, cover has a 3 inch crease otherwise looks beautiful. Was placed in a magazine archival bag for dust protection.